Welcome, we’re Taste the Cracklin Kings Lynn, hog roast caterers of the highest repute and the one you’ll never regret booking if you have an event and need some good old fashioned grub for your guests. We’ve been around for many years now, and no event is too challenging for the Taste the Cracklin chefs and waiting team. We’ve been booked for and have completed with a smile on our face numerous events with thousands of guests. We’re always happy to cater for any type of event, formal or informal, with plenty of different menus optionals available to suit every type of event. But what’s always remained the same is our professional hog roast performance which has left everybody with the Taste the Cracklin name on their tongue, hoping they get another chance to taste one of our hog roasts again. We have a menu that’s a perfect fit every get-together. You could be hosting a party at your home for friends and fanily, or planning on doing something special to reward your staff for a successful year. In either case, there really isn’t a hog roasting team better equipped to make yours an event worth talking about than Taste the Cracklins. Without hesitation we’ll take on your event because we know we have the ultimate combination of culinary and serving skill to complete it in the best of fashions. Our terrific spit roasts have a tantalizing effect on guests. You can never put enough value on the benefits that are brought to the table by the presence of our team. As our menus scale from the simple and traditional hog roast experience to the extravagant and more modern approach to hog roasting, a hog roast with plenty in the way of trimmings, be it canapés, desserts, side dishes and starters, is what you get with a more luxurious experience. We serve each menu in their own individual way. Your hog roast can be had as a buffet, as a sit-down experience, or for the hog roast roll and spit roast roll options you can forego both of those and have your guests served their hog roast roll by getting up close and personal with the hog roast machine and having their spit sandwich carved and served before their eyes. The path to success for us, has been to acquire skilled chefs who have in common with us the passion for hog roasting, to give them the best, most technologically sound hog roast machines, and then we supply them with a non-stop stream of excellent produce. That’s how we make sure our hog roasts are better than anybody elses – that and a few other cooking secrets we’re not quite ready to hand over to our competition! But while we’re not ready to spill all the beans about how we get the quality hog roast results that we do, we’re more than ready to use that expertise and hog roast secrets to give every one of your event guests a hog roast serving fit for a king. When the team at Taste the Cracklin have finished serving at your event, there won’t be anyone left with an empty stomach, hog roasts while being succulent and tasty are also as wholesome as you like, which is why a hog roast is mouth watering and practical. The size of the pig and spit snack rolls we serve need seeing to be believed. The meat is served on the bread in lavish fashion, without any thought for conservatism, so you’ll be plenty full once you’ve worked your way through your hog roast roll. Just as we can send one chef to make a hog roast for hundreds, you yourself can hire a hog roast machine and cook for hundreds of people. We’re not in the business of exaggerating, it’s really that easy to spit roast a pig for a large event that we allow literally anybody to hire our hog roast machines. 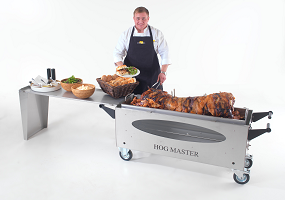 We design and build our own hog roast machines and know that they’re extremely durable and can be used by almost anybody, without any onus on prior experience needed. A Taste the Cracklin machine will come safety guaranteed, they’re CE approved which means they’ve passed quality assurance tests, so you needn’t worry about breaking it or burning your house down! A spit roast machine can be all yours for a day to a month, with a weekly hire being the happy medium. A hog roasted pig will never have tasted as good than when you cook it yourself. Once your hire period runs out you’ll be calling us looking for a job, since it’s that enjoyable to do!